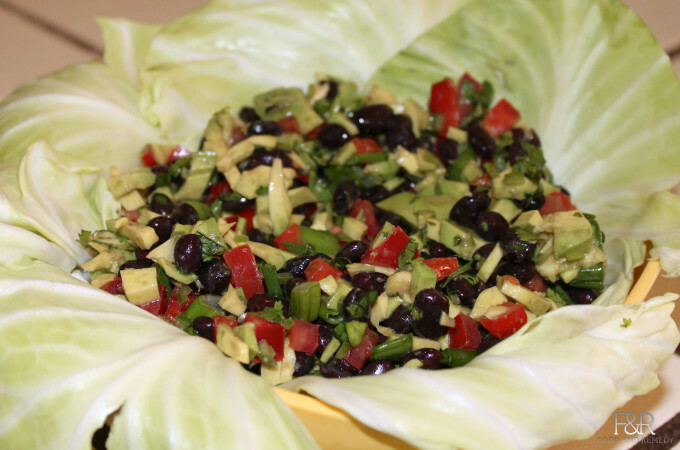 Black beans salad incorporates everything. It is protein rich, have complex carbohydrates and vital nutrients. This is a wholesome salad. This Mexican Salad originated from Mexico. Along with avocado and black beans this Mexican salad is a healthy whole some meal. Black beans are rich in Molybdenum. Molybdenum helps in metabolizing carbohydrates and fats. Including beans in our diet helps in reducing the risk of polyps and colorectal cancer. Black beans added to our diet, provides almost 3/4th of the daily requirement for fiber. Black beans are rich in anthocyanins, a vital antioxidant. Due to black bean’s rich protein and fiber combination, it helps in regulating the blood sugar. Black beans contains greater than 4 grams of soluble fiber, which helps in reducing the LDL cholesterol. Black beans high fiber and protein content keeps you full for a longer time. This reduces frequent craving for food and their by aiding in the goal of weight loss. They are rich in Thiamin (Vitamin B1), which helps to fend the stress and in prevention of memory loss, including Alzheimer’s disease. 1 cup cooked black bean with a ½ tsp salt and drain the water or 16 oz canned black beans drained and rinsed with a squeeze of lemon. 1 Tablespoon finely chopped jalapeño (you can use any variety of green chillies depending your taste). Mix all the ingredients together. Add your favorite dressing. Delicious, colorful Black Bean Avocado Salad is ready to eat! Goes well as a main course or side dish for lunch or dinner. I wonder if lime would go a bit better with the flavors instead of lemon? Great suggestion. Certainly yes, lime adds more flavor. Adding lemon zest along with lime, brings out a very appetizing aroma to the salad. What is the best dressing for the beans salad? Please check out “Easy and Elegant Green Salad” dressing at Jazzy Vegetarian. It goes extremely well with this salad. Addition of some corn from the cob adds a nice sweetness and crispiness! Another great suggestion. Make sure you use non-GMO one.